Beautifully golden brown and dotted with jewel-like dried cranberries and optional chopped pecans, these cute little scones are sure to brighten any holiday table. I named them Christmas Cranberry Scones the year I baked them all afternoon at a kitchen store holiday open house, but they're tasty any time of year. These scrumptious biscotti cookies are perfect for gift giving, dunking, or just plain munching. Never baked biscotti? 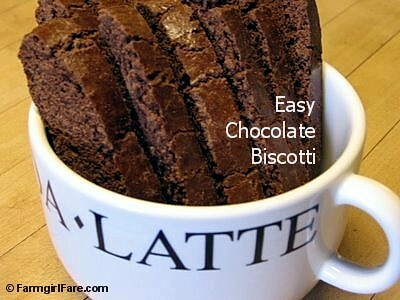 Try my Easy Chocolate Biscotti for Beginners. Homemade biscotti is impressive. Even people who regularly make their own biscotti are impressed when you bake it for them. It's not difficult to make, but by definition it's a twice baked cookie, so it does require a fair amount of time. Because it looks so perfect, and because it keeps so well, homemade biscotti makes a very nice gift. Package it in little cellophane bags tied with colorful ribbon and people will think you spent a fortune on them at a fancy bakery. I came up with this recipe several years ago and haven't made it nearly enough since. It's a pleasant, not too hard, not particularly sweet biscotti cookie that lasts for days and even improves with age. It also freezes beautifully. It holds up to dunking but tastes great by itself, and I think it goes well with everything from hot coffee to cold champagne. If you're craving a sweeter or fancier dessert, you could dip one side of each piece in melted chocolate. Or you could dunk your biscotti in amaretto, or break up a few pieces, stir them into some nice vanilla ice cream, and drizzle it with a little chocolate sauce. This healthy, festive salad—gussied up here with dried cranberries and garbanzo beans—is packed with antioxidants, beneficial ingredients, and flavor (recipe here). I love this raw brussels sprouts salad even more than I love my Quick Roasted Brussels Sprouts with Lemon and Parmesan, and you know I love them a lot. I came up with it back in 2009 and have been devouring it for breakfast, lunch, dinner, and snacks ever since. My recipe notes from 4/15/09 say I mixed up that batch at midnight. You've been warned. Raw brussels sprouts have a wonderful taste; it's as if the flavor from an entire regular sized cabbage has been concentrated down into each little sprout. And of course they're extremely good for you. It's always nice to be crazy about something that's heavenly and healthy. The basic version of this salad recipe is wonderful, but I usually gussy it up with a healthy boost of either raisins and roasted almonds or dried cranberries and garbanzo beans. The brussels sprouts are quickly shredded in the food processor (or use a mandoline slicer or sharp knife), and the tangy dressing can be made several days ahead. This salad would make a fresh and lovely addition to the holiday table, but if one of your goals for 2014 is to up your intake of cruciferous vegetables, it would also be a delicious way to usher in the new year. Raw brussels sprouts at midnight, anyone? Craving more than crunch? You'll find links to all my sweet and savory Less Fuss, More Flavor recipes in the Farmgirl Fare Recipe Index. 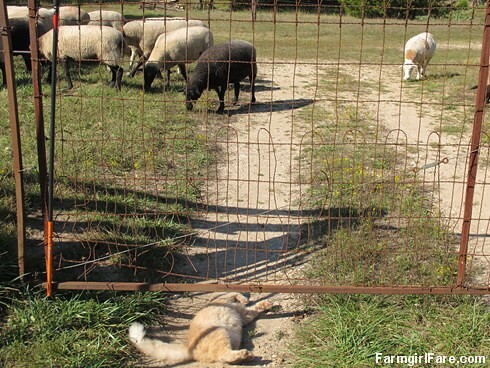 © FarmgirlFare.com, where it's all about the food—and the cute. More photos and farm news below. . .
An old-fashioned treat that brings back—and makes—memories (recipe here). I've been making these Big, Soft, and Chewy Molasses Ginger Spice Cookies all year round for at least a dozen years, but they always seem so festive during the holidays, reminding me of ice skating and red mittens and crackling fires and early Christmas morning. I started baking and selling over-sized cookies 28 years ago, and everyone from little kids to big tough men goes crazy for them. What's especially nice is when one cookie batter will give you two completely different cookies, just by changing the size. 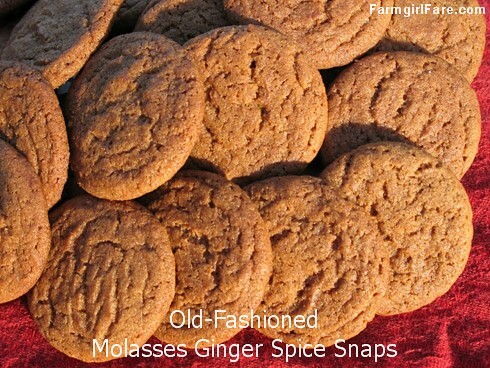 These 2-inch Molasses Ginger Spice Snaps are cute and crunchy, and one batch bakes up 12 dozen cookies that store really well, making them perfect for gift giving. I like to pack them up in little cello bags and tie them with a colorful ribbon. Both versions of these cookies also freeze beautifully. Can't survive on just cookies? You'll find links to all my sweet and savory Less Fuss, More Flavor recipes in the Farmgirl Fare Recipe Index. © FarmgirlFare.com, where the snow is melting, the wood furnace is roaring, and the two batches of these cookies I've made so far are long gone. It's the coziest, tastiest time of year! This quick dessert is perfect for holiday get togethers & goodie tins (recipe here). It's Snowed In Day Seven! We probably could have climbed out of our cozy little valley during the past week if we really needed to, but thankfully we didn't. Tomorrow we'll see if we can make it to town 10 miles away to get our mail (the post office doesn't deliver out to the farm), stock up on dog food at the (only) store in town, and pick up a couple gallons of that wonderful Jersey milk from our neighbors. We'll wait until next week to head to a 'real' city to load up with holiday groceries and 750 pounds of sheep feed. Friday we're expecting more ice and snow. Today the sun is out, the sky is bright, the snow has slowly started melting despite single digit temps each night (Saturday morning it was -6F), and we're craving chocolate something fierce. There's nothing like trekking out to Donkeyland through the snow (with Jasper!) 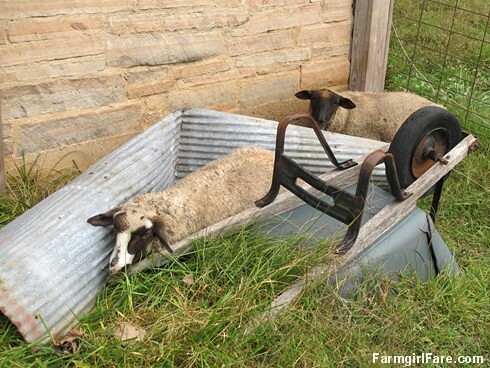 or whacking through several inches of ice in 8 water troughs to work up and appetite and get your sweet tooth going. 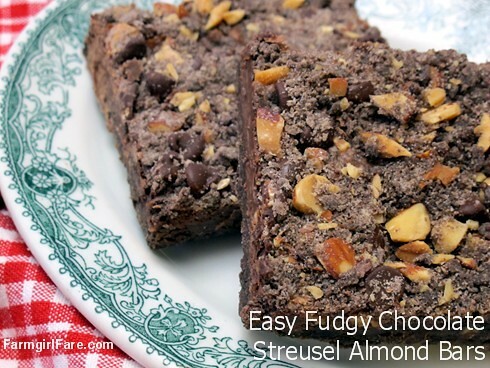 I've been making these fudgy and foolproof Chocolate Streusel Bars for years. Like my popular Quick and Easy Raspberry Almond Bars, people always get so excited over them it's almost embarrassing to admit how easy they are to make. The top and bottom layers are the same batter, and the rich, fudgy middle is simply chocolate chips and sweetened condensed milk melted in the microwave. They're perfect for holiday munching and gift giving because they look good, travel well, and stay fresh for several days. The 9"x13" pan makes plenty, and you can cut them large or small. Enjoy! Can't live on dessert alone? You'll find links to all my sweet and savory Less Fuss, More Flavor recipes in the Farmgirl Fare Recipe Index. © FarmgirlFare.com, where life is always cozier with freshly baked bread, and my first batch of pain au levain in years (made with my new wild yeast sourdough starter!) will be ready for the oven soon. I can't wait to tear into those crusty loaves. You'll find my Ten Tips on How To Bake Better Artisan Breads at Home here. Friday Farm Photo: Have a Warm & Cozy Weekend. We're snowed in! We have 10 inches of snow (over a layer of ice) on the ground, and it looks like it's going to be here for a while. Tonight it will probably dip down below zero (F), and the highs for the next several days are the usual lows. It's cold but beautiful. Thankfully we had plenty of advance warning about this big storm, and except for a collapsed mini greenhouse full of baby spinach in the garden and the already frozen freezeless hydrant at the barn (which means lots of water hauling from the spring 200 feet away) things are, knock on wool, so far going smoothly. Everyone has food, water, and shelter (not that most of them are using it), and we are tucked in for the night, binge watching 24 and basking in the heat of the glorious wood furnace, which is such a change from the little old pot bellied stove in the uninsulated Shack. We have hot homemade pizza, cold champagne and potato chips, and a reassuring stockpile of chocolate. Inbetween feeding treats and breaking ice tomorrow I plan to slow cook a couple of lamb shoulder roasts for hours in the dutch oven and create a new sourdough starter. 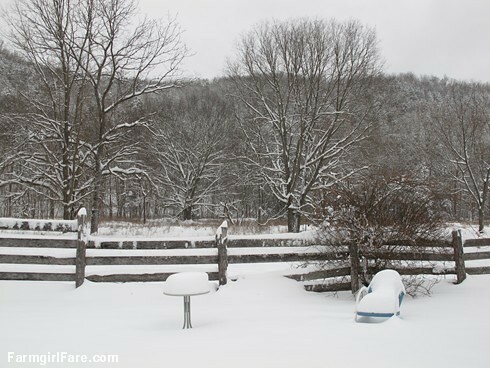 © FarmgirlFare.com, where the occasional big snowstorm is hard work but fun—and a reminder that this former California girl would probably never survive on a farm in Minnesota (which is where our way-too-much-for-us furnace was made). Every year in early December my Easy Chocolate Biscotti Recipe becomes one of the most popular recipes on Farmgirl Fare. Holiday baking season has begun! 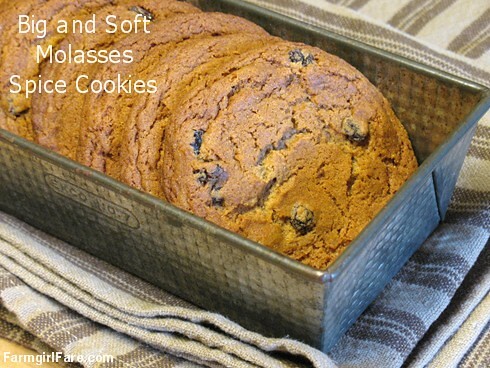 My simple recipe is ideal for first time biscotti bakers for two reasons: the buttery dough is easy to work with, and the chocolate makes it dark, so no one will be able to tell if all your cookies aren't the same exact shade of golden brown. These biscotti stay fresh for several days, making them perfect for gift giving. They also freeze beautifully. The cookies have a nice (not break-your-teeth) crunch that stands up to dunking in coffee, but they also taste great on their own. But don't just take my word for it. Below is a sampling of what others have said about this recipe since I originally posted it back in 2005. I especially love hearing about all the signature touches. Mint chocolate chips mixed in to the dough? Yes, please! Thursday Dose of Cute: Happy Thanksgiving! Wishing you beauty, balance, and grace this holiday season. 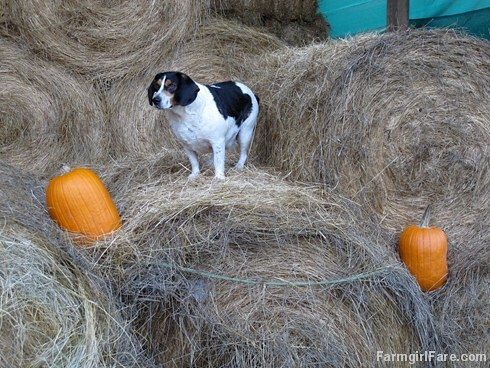 © FarmgirlFare.com, thankful for too many things to count. This simple, flavorful cauliflower purée makes a healthy Thanksgiving side dish, but I like it all year round (recipe here). Several years ago I fell in love with kohlrabi purée, and from there I went on to discover a whole delicious world of puréed vegetables. One of the most popular puréed vegetables is cauliflower, which is often called mashed cauliflower. Recipes for mashed cauliflower abound, calling for everything from chicken stock and Greek yogurt to a stick of butter and a cup of heavy cream. My simple version, which has just 2 Tablespoons of butter and 2 Tablespoons of milk or cream, is low fat, low carb, easy to make, and really hard to stop eating. You can dress it up in all sorts of ways—with sour cream and dill, cheddar and chives, even lemon juice and baby arugula—or just enjoy it plain. 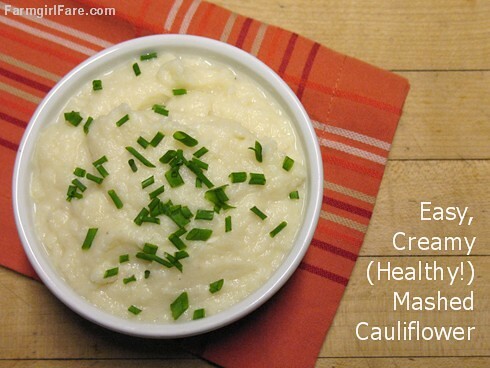 Mashed cauliflower is usually touted as a low carb substitute for mashed potatoes, especially around Thanksgiving. But this really isn't fair to the cauliflower purée, because it tastes so good it shouldn't be considered a stand-in or alternative to anything. If you have trouble eating enough fresh vegetables in autumn and winter, try puréeing them. I had no idea it was so easy to devour an entire head of cauliflower. 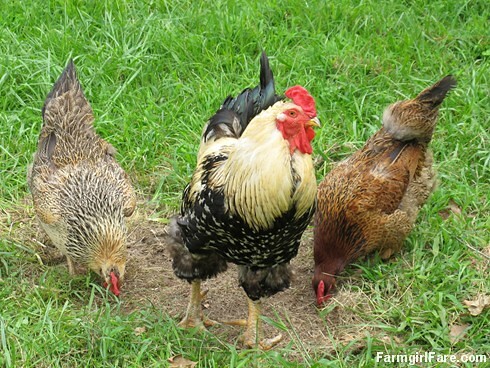 © FarmgirlFare.com, where you'll always get a healthy dose of good food and cute critters. A healthy vegetable side dish that's nice enough for Thanksgiving, yet easy enough to make for everyday (recipe here). Hip hip hooray, it's Brussels sprout season! This is a little shout out for my quick and easy, one bowl, one pan, super popular roasted Brussels sprouts recipe. There's no need to cut a little X in each stem or boil them before roasting. You don't even have to turn them while they're cooking. And oh, do they taste good. I gobbled up two pounds last week (they actually reheat pretty well in the microwave) and have two more pounds of raw sprouts waiting in the fridge. Toss them with lots of lemon juice and Parmesan or Pecorino, or gussy them up a little with some garbanzos and dijon. If you're lucky enough to have any leftovers (I always double the recipe), try tossing them with some bowtie pasta, crumbled bacon, and pan-fried (in bacon grease) fresh breadcrumbs. Oh my. —I did the "simple" with Orecchiette pasta and lots of parmesan. So savory and perfect! I never thought to cook them at such a high temp, but I loved it. Thanks! © FarmgirlFare.com, the sprout crazed foodie farm blog where one of us has been known to eat leftover roasted Brussels sprouts for breakfast. This simple, flavorful soup is thick and rich but not loaded with calories or cream (recipe here). It was 11°F on the farm Wednesday morning. Soup season has begun! I could probably eat soup every day in winter, and this Roasted Leek and Potato Soup with Arugula is one of my favorite recipes. 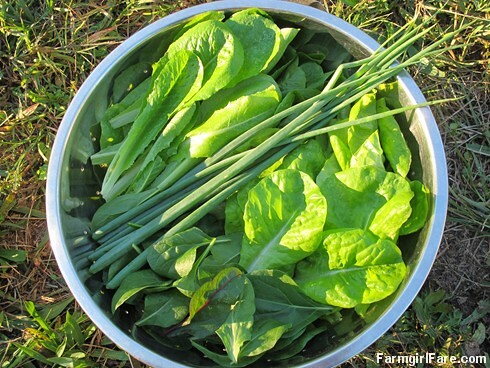 In anticipation of our first arctic blast—which arrived several weeks earlier than usual—I harvested as much as I could from the kitchen garden on Monday and Tuesday, including a small bag of arugula, a big bag of mixed baby lettuce, a bigger bag of tatsoi, and a several bags of kale. I see a lot of salads in our future, but on Sunday I dug up several pounds of the best looking Yukon Gold potatoes I've grown in years, so this scrumptious soup is also on the menu. It's hearty and healthy and full of flavor, especially if you use homemade chicken stock, which freezes well and is ridiculously easy to make (instructions on how to make your own chicken stock are included in the soup recipe). No leeks? Just use onions. No arugula? Try spinach instead. 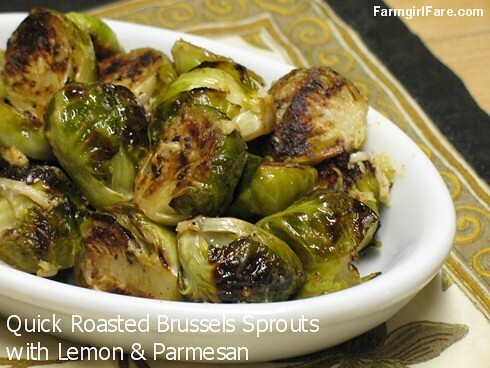 The roasted leeks and potatoes also make a delicious side dish. Snuggle up and enjoy! 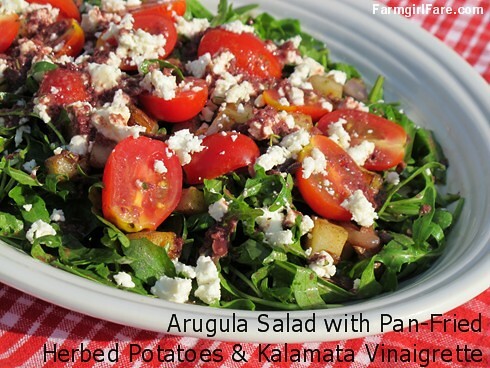 Did you know arugula is easy to grow? 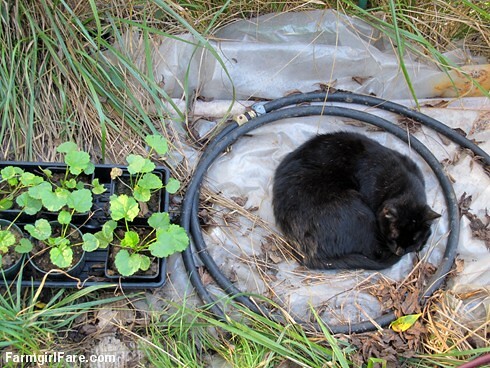 This gourmet green thrives in cool weather and doesn't take up much space. It's also really good for you. Learn how to grow arugula from seed in less than a month here. Monday Dose of Cute: It's Monday! Friday Farm Photo: Have a Lovely Weekend. Morning view out the bedroom window (taken on 10/25; that tree is bare now). 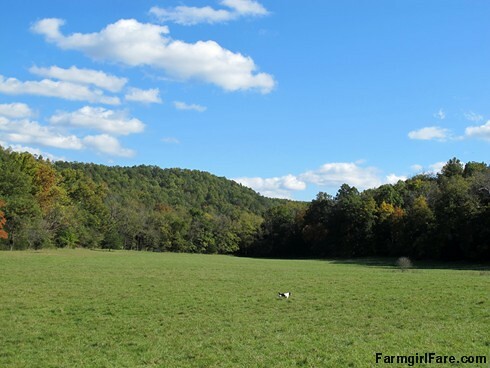 © FarmgirlFare.com, where white-tailed deer have taken over the hayfield. On Wednesday morning we even saw four big bucks at once. This evening Bert and Bear started barking like crazy at three does up close to the house; all three of them just stood there staring at us. Mom and the twins are still out there and doing just fine; we see them nearly every day. The babies are almost grown up! This is a low maintenance time of year with the sheep. Breeding season is over, lambing season won't start for another three months (which I know will go by in a flash, it always does), and there's still enough good food out in the pastures so that we don't have to do any supplemental feeding. We're behind trimming hooves, but we're always behind trimming hooves. If the weather and the grass hold out, we may not have to start feeding any of our homegrown organic hay until winter, which would be really nice. In another few weeks we'll separate out the 15 bred ewes (including the two that I'm afraid aren't pregnant since they were seriously flirting it up with Da Big Guy the other day) and start giving them a daily ration of grain to make sure they're consuming enough calories to sustain the twins and triplets that are probably growing inside most of them. This past lambing season we ended up with 19 live lambs from 9 mamas, and not a single single. 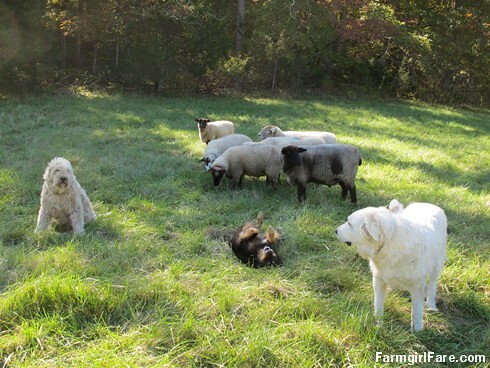 For now, though, the entire flock is fat and happy and living together (minus our ram, Da Big Guy, and his buddy Teddy) with their guard dogs, Daisy and Marta, out in the securely fenced, big front field. This means peace of mind for us, and an easier job for the dogs, since they don't have to worry about any of their sheep wandering off in search of better snacks. Twice a day I head out front to count and check on everyone and visit with the dogs (and maybe do a little sheep snuggling too). Lately the flock has been resting at the very far end of the field, but I don't mind the hike. With the lovely weather and beautiful autumn color we've been having, this is definitely one of the most enjoyable parts of my day. And it's always more fun when Bear and Bert come along with me. 18 more photos below. 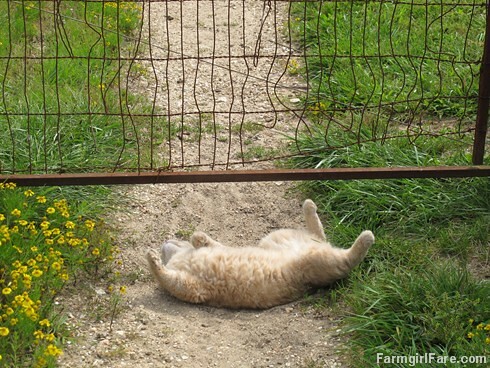 . .
Friday Dose of Cute: Have a Relaxing Weekend. 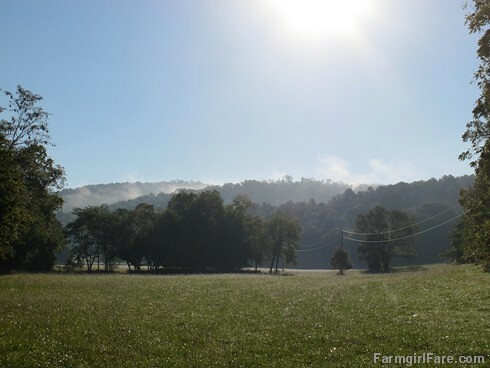 © FarmgirlFare.com, still getting used to the fact that it was 21 degrees this morning. Polar fleece, here we come! Mother Nature always gives us a leaf changing show in the fall, but we never know how good it will look or exactly when it will happen. This year? The time is now. And it's looking very nice indeed. 7 more photos below. . .
11 more photos below. . . It may have taken until October, but I finally have tomatoes, potatoes, and arugula in the kitchen garden at once. Let everyone else go on about apples and butternuts and pumpkins; I'm making this Arugula Salad with Pan-Fried Herbed Potatoes, Cherry Tomatoes, Feta Cheese, & Kalamata Olive Vinaigrette. Somewhere in the midst of an overwintered kale extravaganza and a lettuce explosion last spring, I forgot to plant any arugula. Fortunately this cold-loving little brassica can go from seed to salad bowl in less than a month, so the two small patches I planted in early September are already providing us with peppery bounty. Despite several nights in the low 40's and even one chilly dip into the 30's, my four Sweet 100 cherry tomato plants are still ripening up a few fruits, thanks to an old bed sheet protecting them from the cold. And although the Yukon Gold potatoes were ready months ago, I've found that the best place to store them is right in the ground where they grew. These herby potatoes taste great on their own, and the quick kalamata olive dressing is nice on other salad greens too. To make this a more substantial meal, simply add some slices of leftover grilled chicken or steak. No arugula? Try some nice crunchy romaine lettuce. I've been having really good luck the last few years growing Parris Island Cos, a tasty heirloom that is amazingly heat tolerant. Seasonal eating can sometimes be a little tricky, and even a little tiresome, especially if you live in the middle of nowhere. But after 19 years of tending a large garden while living far from many ingredients, I've learned that the (sometimes year-long) wait for a special dish just makes it taste that much better. It's a brief and special time in the garden right now, when the late summer bounty overlaps the first fall harvest, and this scrumptious salad is the perfect way to celebrate it. Once, until next year. P.S. 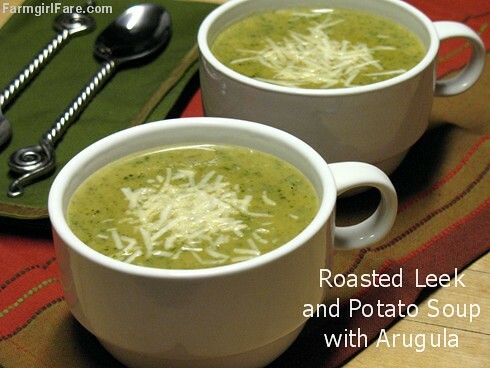 Arugula Cottage Cheese Dip/Spread/Sauce and Roasted Leek and Potato Soup with Arugula. © FarmgirlFare.com, always eating well, just not always on time. 8 more photos below. . .
More farm landscapes? Here and here. 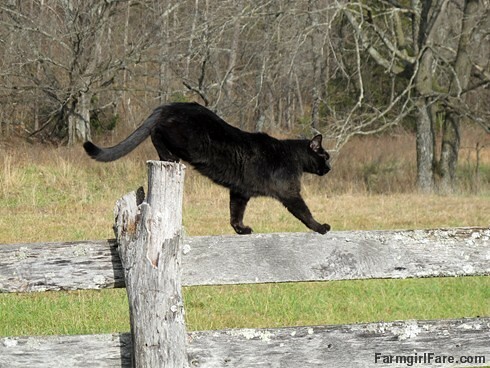 © FarmgirlFare.com, always moving toward the food. 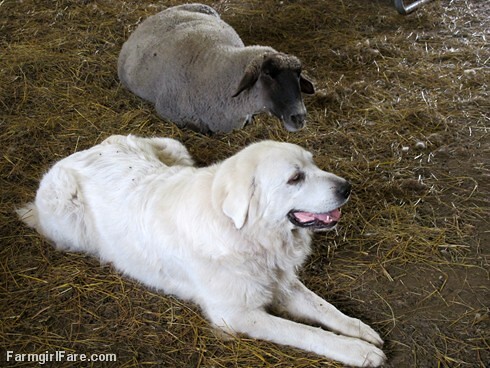 Great Pyrenees livestock guardian Daisy and nine-year-old pet wether Teddy. 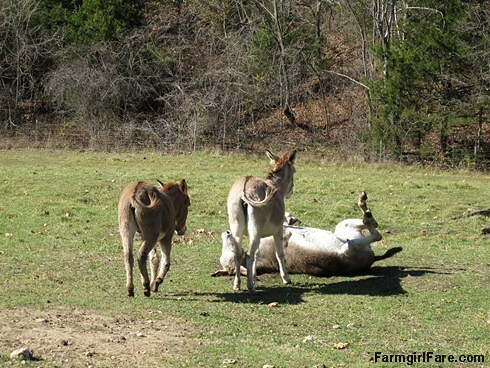 Bye, bye, breeding season! These weeks are flying by so fast it's frightening. 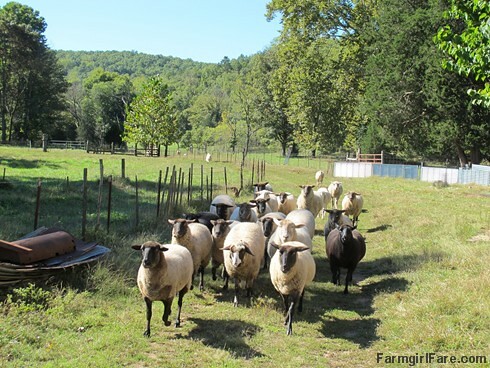 On August 27th we moved our six-year-old ram, Da Big Guy (born during the 'D' year) in with 15 ewes, and last Thursday we moved him back out. If all went (and goes) well, adorable bouncing baby lambs should start arriving the end of January. A ewe cycles every 17 days, so we kept the ram in a pen with them for 37 days: two cycles plus a few extra days just in case. Hopefully, though, lambing season won't last nearly that long. Last year nine ewes had 19 live lambs (plus one newborn that died), which was fantastic, but they spread those lambs out over a month. The idea is to have all the lambs arrive in as short a time as possible, although that doesn't always seem like a great plan when you're short on sleep and babies are being born every time you turn around. 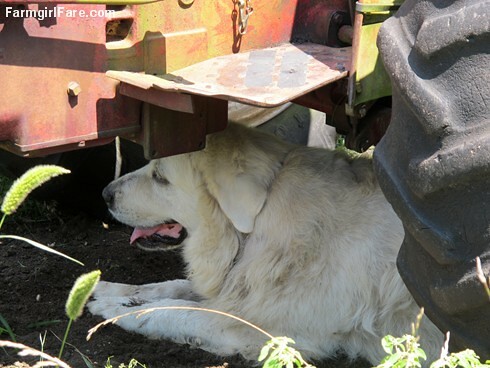 But the alternative—endless days of round the clock barn checks with nothing going on—is even more exhausting. During the past few years we've significantly reduced our flock in an all around effort to simplify our lives and reduce expenses, so besides Da Big Guy and his 15 babes, we had a separate splinter flock this year of just eight sheep: three 2013 lambs that we'll have butchered next spring, three big old pet wethers (they also make great ram companions), my baby Cary (who I decided not to breed again after her first horrible experience), and nine-year-old Silly, a sweet old retired girl who is Da Big Guy's mother. When we pulled Da Big Guy out last week, we put Teddy (aka Uncle Teddy) in with him and merged the rest of the flock back together. 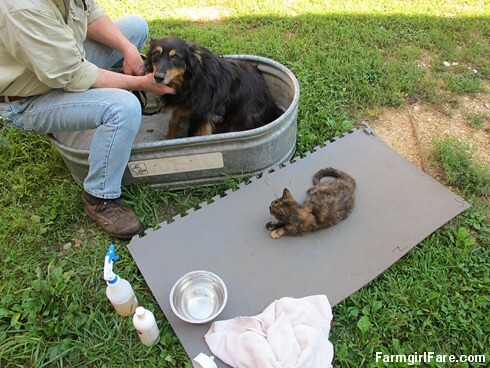 We combined this merger with a sheep working session, trimming some hooves, running everyone through a zinc sulfate foot bath to treat foot scald (raw spots between the toes from moisture), and giving everybody a dose of organic garlic juice and apple cider vinegar as a natural wormer and all-around health tonic. More photos and story below. 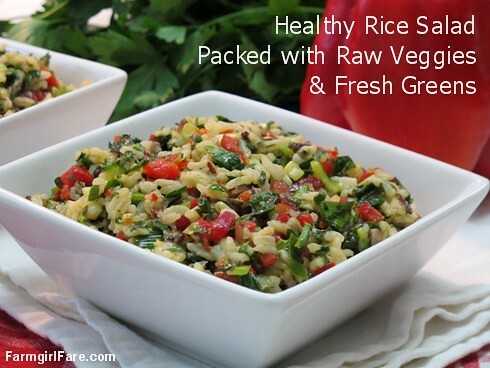 . .
A pile of fresh vegetables and herbs is stirred into hot rice, then tossed with a simple olive oil and lemon dressing: easy, nutritious, gluten-free, delicious! We love rice, and of course we love all-natural foods that are produced by socially responsible companies. So when my publishing network, BlogHer, asked if I was interested in creating a healthy recipe using one of RiceSelect's Royal Blend® rices as part of an upcoming ad campaign (which helps me and over 3,000 other mostly women bloggers bring you all our blog content for free), I said sure. RiceSelect™ is a research based company focused on high value organic and all-natural products. All RiceSelect products are verified non-GMO and are grown, milled, and packaged in the United States under the most stringent farming and production guidelines. 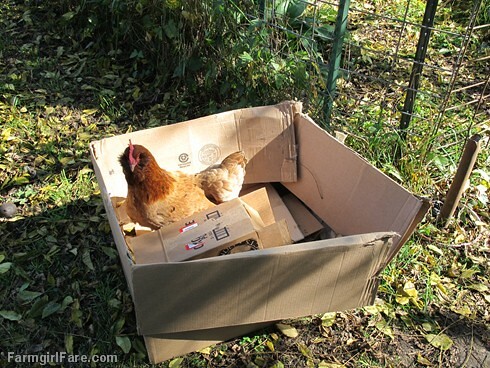 Their farms use a sustainable environmentally friendly process that assures socially responsible production. There are three RiceSelect Royal Blend® products, and my recipe calls for the Royal Blend® with Brown, Red, & Wild Rice, which is an all-natural blend of Texmati White, pre-cooked brown, wild, and Thai red rice. It has no added sodium, a wonderful nutty flavor, and is ready to eat in less than half an hour. In the 15 minutes it takes the rice to cook, you can turn a simple side dish into a healthy, colorful, flavor-packed feast. A pile of fresh vegetables and herbs is stirred into the hot rice then tossed with a simple olive oil and lemon dressing. It's delicious warm, cold, or at room temperature. Fresh salad fixings from the organic heirloom kitchen garden. Ready to do something really good for yourself? It's not too late to join me for Marianne Elliott's upcoming 30 Days of Yoga: A Lifetime of Well-Being. The preparatory lessons start next week. You can read more about this wonderful course (which I've done before) here, and you can register here. I hope to see you there! Friday Farm Photo: Have a Beautiful Weekend. 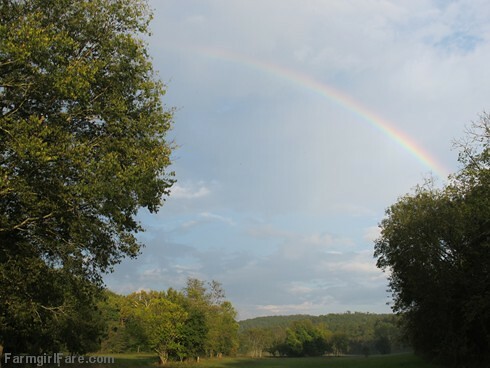 After a brief rainstorm yesterday. 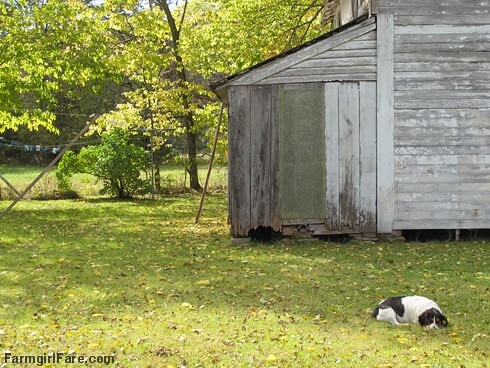 © FarmgirlFare.com, shiny and bright, not a coyote in sight—but we can hear them howling out there all night. Very ripe pears are the secret to this flavorful, foolproof pear butter that will keep in the fridge for a few weeks. No canning required! (recipe here). Pears are in season, and there's nothing like homemade pear butter. 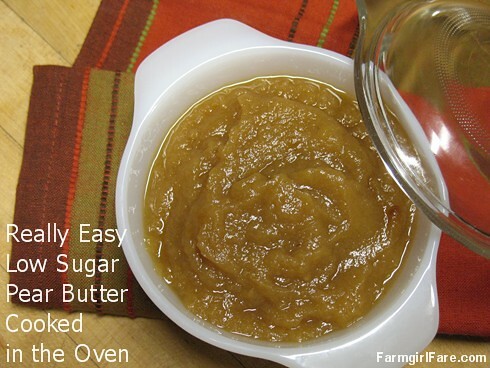 This popular Really Easy Low Sugar Pear Butter recipe I shared a few years ago is so simple, and it tastes divine. There's no peeling or coring required, and because it cooks in the oven instead of on the stove top, you don't have to babysit a simmering pot for hours. It's also a great way to use up bruised and battered pears, which taste extra sweet. Pears are plentiful and cheap right now, and in many places they're available locally grown. Unfortunately pears are also high on the Environmental Working Group's list of Most Contaminated Produce (apples are #1), so it's especially important to seek out organic pears if at all possible. If you're facing a mountain of ripe pears, making pear butter is the perfect way to use them up. You can process jars of pear butter in a waterbath canner, but it will keep unprocessed in the refrigerator for at least a couple of weeks (I never have any around longer than that). 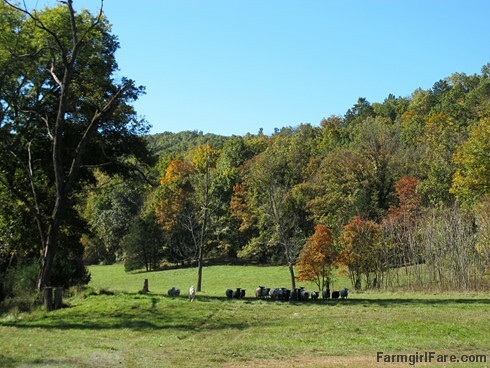 © FarmgirlFare.com, sharing recipes, stories, and photos from our crazy country life on 240 remote Missouri acres—but not real good about sharing the homemade pear butter. You don't have to tell them twice. More of the front field? Here. 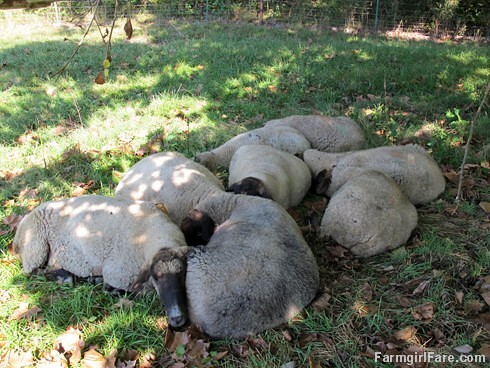 © FarmgirlFare.com, where it may be the end of September (and we may have had that little cold snap last week), but we're all still seeking out some shade—especially for naps. Friday Dose of Cute: Weekend Plans? Hanging out in the homemade fort. 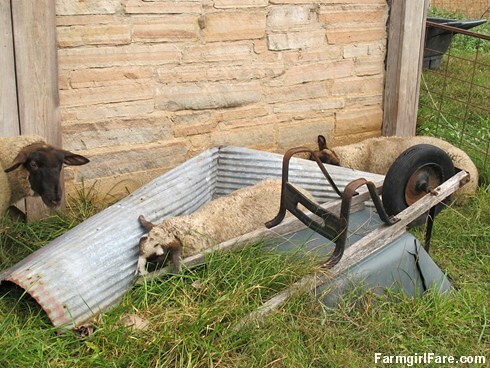 © FarmgirlFare.com, where you're never too old (or too wooly) to play—and there's old junk cool building material all over the place. 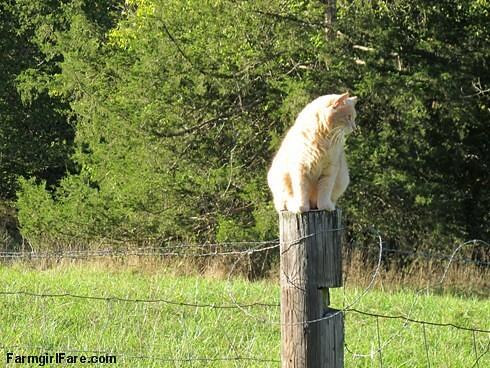 Sunday Farm Photo: Happy, Happy. . . It's that time of year when you can feel the entire farm breathe a sigh of relief. 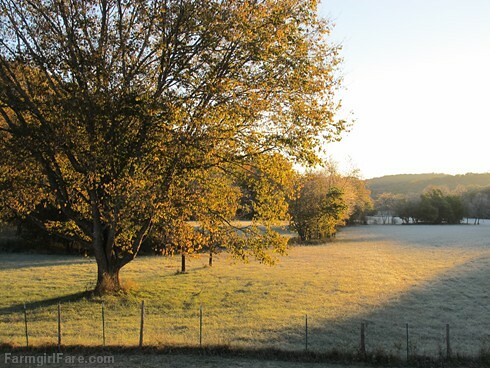 © FarmgirlFare.com, thrilled that it's 45 degrees cooler than it was just a couple of days ago (at night at least! )—and already pulling out the vintage quilts while snuggled up in sweats. Flattening the baby kale. . .
And staying inside the lines. 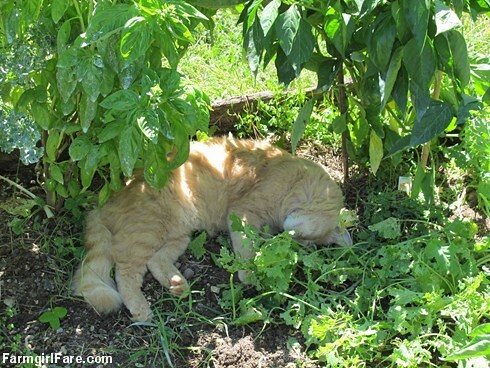 © FarmgirlFare.com, where there's lots going on in the garden—and it's good to be a cat. Have some good clean fun this weekend. 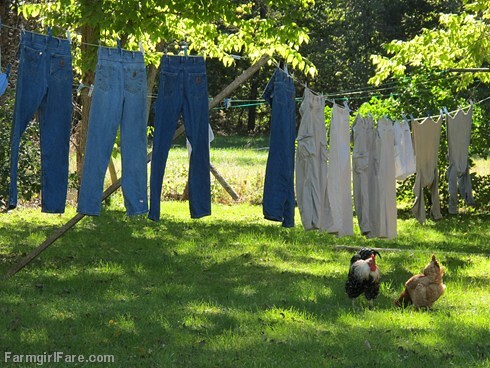 © FarmgirlFare.com, thoroughly washed—and less terrifying than it looks. 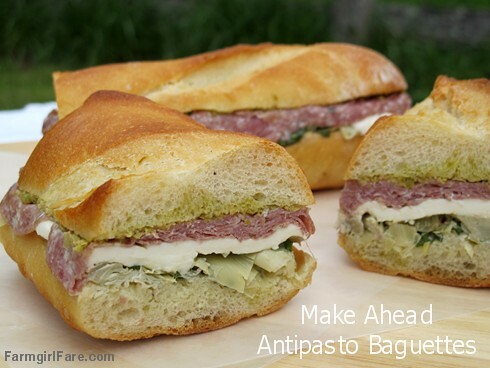 These scrumptious make ahead baguette sandwiches, piled high with salami, mozzarella, marinated artichoke hearts, and homemade green olivada, combine the flavors of an Italian antipasto platter in a handy, portable form. While working on this Lemony Tuna and Artichoke Cooler-Pressed Sandwich recipe last spring, I fell in love with the idea of sandwiches that actually improve in flavor if allowed to sit for a while. Convenient and better tasting? That's my kind of food. These antipasto baguettes taste best when prepared the day before serving, making them perfect for toting on picnics, hikes, and road trips, or packing in school and work lunches. Or just enjoy the simple pleasure of knowing that a delicious sandwich is waiting for you in the fridge. This traditional Italian bread salad is given a Greek twist with feta cheese and kalamata olives. Crunchy pan-fried olive oil croutons are hard to resist (recipe here). 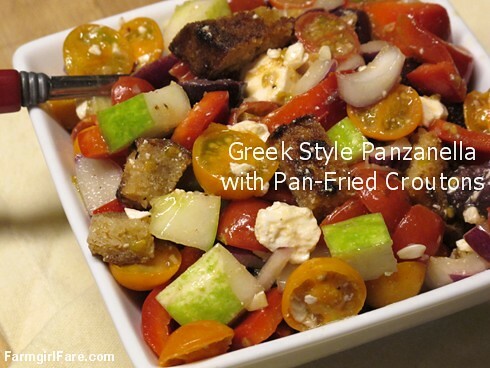 This Greek Style Panzanella Salad is one of my favorite recipes, and I've been looking forward to making it all summer. I'd never been a fan of panzanella, which I always thought of as soggy bread salad, until two summers ago when I came across Ina Garten's Greek style version. I have five words for you: pan-fried olive oil croutons. This colorful salad is made with cherry tomatoes, cucumbers, sweet peppers, kalamata olives, feta cheese, red onion, and crunchy homemade croutons, all tossed with a flavorful red wine vinaigrette. It makes a great side dish for grilled meats and a perfect light supper or lunch. I've even eaten the leftovers for breakfast. To make it more substantial, stir in some organic garbanzo beans. The lemon cucumber vines and four enormous Sweet 100 cherry tomato plants (that I planted way too close together) in my kitchen garden have been overflowing with beautiful bounty for weeks, and what's left of this year's small but tasty red onion harvest is safely tucked in the pantry. But not a single pepper on my 21 pepper plants has yet to turn completely yellow or orange or red (I can't stand green peppers). I'm running out of patience—and am probably going to run out of cherry tomatoes and cucumbers and onions. Fortunately I managed to score seven sweet red peppers from my Amish friend Sarah's little produce stand, which is basically a large table set under an overhang next to the house where she piles extra vegetables from their enormous garden and advertises with a sign out on the highway. If there's nobody around, please leave your money in the can. When we stopped by last week and I was picking through a bucket of green peppers in search of any red ones, she said a woman had just come by and bought every red pepper she had. "I thought about telling her I needed to save some for Susan!" Thankfully the shopper who stopped by right before we did yesterday had only wiped her out of tomatoes. Sarah even tucked an extra pepper in my bag, "Since these are all kind of small." As long as they aren't green, I'm happy. Let's eat! P.S. Savory Tomato, Mozzarella, and Basil Pesto Pie (with an easy cheesy biscuit crust) and No-Cook Fresh Tomato Pasta Sauce. © FarmgirlFare.com, the burnt fingers foodie farm blog where I just made a batch of croutons using some stale slices of an Easy Four Hour Parisian Baguette and had to come upstairs so I wouldn't devour the entire batch straight out of the cast iron skillet. This was an actual conversation. . . Beat the heat with this simple, refreshing gazpacho, a healthy no-cook summer recipe that's packed with tomatoes, cucumbers, sweet peppers, onion, and garlic (recipe here). That crazy wonderful cool spell is history, the wet weather creek has dried up, and I'm back to watering the kitchen garden every day. (It was such a treat to have three weeks off from watering!). Our regularly scheduled hot and humid August has returned, and with it a craving for my favorite quick and easy gazpacho. Thank goodness the tomato plants in the garden have finally started putting out. Packed with nutrients and full of flavor, this low fat chilled vegetable soup is the perfect thing to keep in the fridge for those sweat-drenched, sweltering summer days when nobody feels much like eating, let alone cooking. It'll fill you up without weighing you down and is a delicious way to cool off. There's no need to blanch, peel, seed, or force anything through a sieve, and all of the vegetable goodness ends up right in your bowl. 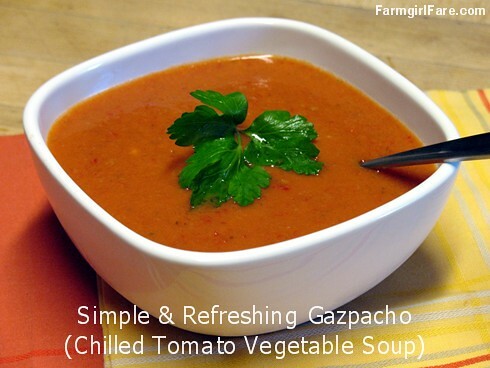 If you've never had gazpacho—which some people refer to as liquid salad—I urge you to give it a try, even if, like me, you're not usually a fan of cold soups. There are about three million ways to make gazpacho, and people put all sorts of things into it (gelatin, shrimp, or raw eggs, anyone? ), but when I made my first batch five years ago, I decided to take the straightforward route with both ingredients and technique. My smooth and simple version is basically a thick raw juice, which can be sipped rather than slurped—and easily made thinner—if desired. A celery stick and splash of vodka are optional. I love it with a dollop of plain yogurt. Make it a day ahead if you can, as the flavor increases dramatically after sitting overnight in the fridge. Enjoy! P.S. Easy Homemade Tomato Vegetable Juice (like V8 only better) and Fiesta Cottage Cheese Veggie Dip. 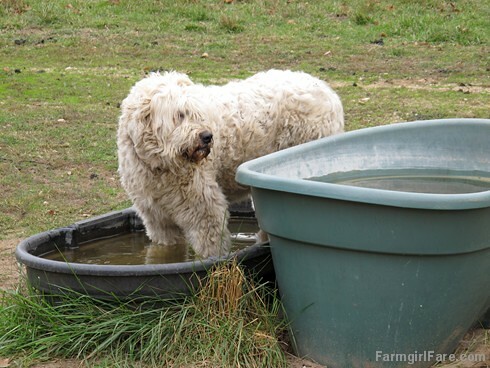 © FarmgirlFare.com, where we're dreaming of polar fleece and telling ourselves that all this sweating has to be good for us—and there's a batch of gazpacho in the fridge. Friday Dose of Cute: Have a Happy Weekend. Four more photos below. 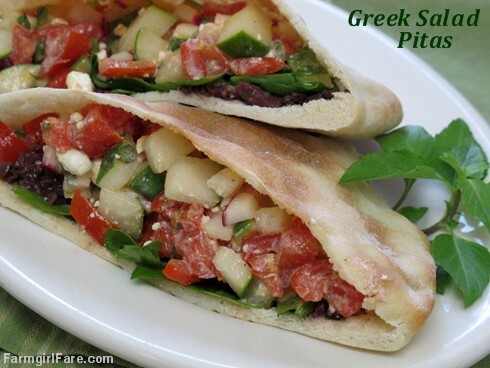 . .
Pita breads are stuffed with crunchy Greek salad, baby spinach, and a quick and easy kalamata olive tapenade for a healthy light supper or lunch that celebrates the bounty of summer (recipe here). The cucumbers and tomatoes are in full swing in the kitchen garden, and these scrumptious Greek Salad Pita Sandwiches are on the menu. Using baby spinach instead of lettuce adds extra flavor and nutrients, and the radishes offer a nice zippy crunch, but it's the quick kalamata olive tapenade that really makes these sandwiches shine. Keep some on hand in the fridge, along with pitas in the freezer (they defrost at room temperature in just a few minutes), and you'll be able to put together a beautiful meal in no time. For a real treat, whip up a batch of easy homemade pita bread (pictured above). Enjoy! P.S. Greek Style Panzanella Salad and Middle Eastern Vegetable Salad (Fattoush), plus Growing (and Using!) Greek Oregano (and Five More Favorite Herbs). © FarmgirlFare.com, sliced, diced, and stuffed with good food. A moist and flavorful zucchini bread that's packed with wholesome ingredients (recipe here). Got kids heading back to school? This 100% Whole Wheat Coconut Zucchini Bread just might be the perfect after-school snack. 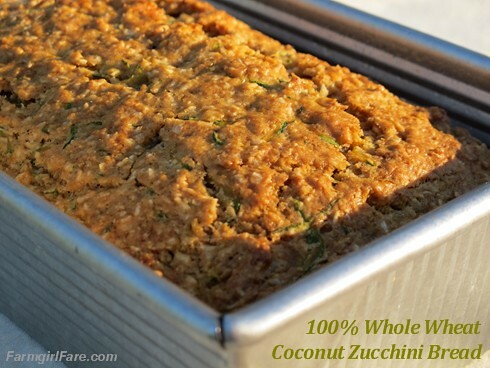 Made with whole wheat flour, coconut oil (which is incredibly good for you), unsweetened coconut, less sugar than many zucchini bread recipes, and of course, zucchini, it's a healthy indulgence that still tastes like a treat. But you don't have to mention any of that when you serve it. If you've never had natural, unsweetened shredded coconut, you're in for a pleasant surprise. The coconut flavor really comes through, and unlike the highly processed sweetened stuff, it doesn't contain preservatives like propylene glycol and sodium metabisulfite. Unsweetened coconut keeps best refrigerated or frozen (I buy four bags at a time and store them in the freezer). This hearty zucchini bread also makes a great breakfast on the run or mid-morning pick me up. I love it sliced and toasted with a glass of really cold milk. Enjoy! P.S. Heavenly Lemon Coconut Quick Bread and Soft and Chewy Oatmeal Coconut Cookies, plus How To Freeze Zucchini (and my one claim to fame). © FarmgirlFare.com, where if you're gonna go nuts, it might as well be coconut.